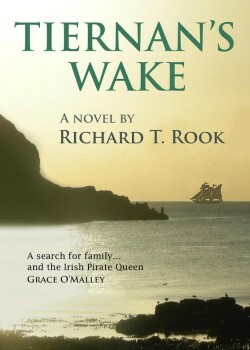 Tiernan’s Wake by Richard T. Rook is a thoroughly enthralling book set between America and Ireland. The subject of this story, genealogy, is a very popular past time – after all, who would not be intrigued to discover the skeletons in their cupboard, a murderer, royalty, or perhaps even a pirate! The story features Irish American lawyer, Michael Tiernan, a keen amateur genealogist, who is contacted by Aeden Burns, an Irish writer and historian. He has been following Michael’s progress in the online genealogy sites and believes that if they team up, together they can find the treasure of the famous Pirate Queen of Connacht, Granuaile Mhaol, or Grace O’Malley, and hopefully discover the whereabouts of the only portrait of her which is believed to exist. From there this story expands into a fascinating historical adventure, and a mystery the famous Sherlock Holmes would have been proud to solve! Who was she really, this Grace O’Malley? A force to be reckoned with, a noblewoman who met with the queen of England on equal terms, captivated men, and ruled the waters of western Ireland at such a turbulent time in 16th century English and Irish history. Working together from both Ireland and America, the dedicated researchers each with a love of mystery solving and riddles, soon begin to find trails which lead to unusual messages hidden in code, clues sitting in plain sight, and never before discovered ancient documents. As the characters in this story uncover the mystery, they also find themselves discovering more about themselves and the people they have become, reflecting not only on their lives, but also perhaps on those who have come before them.